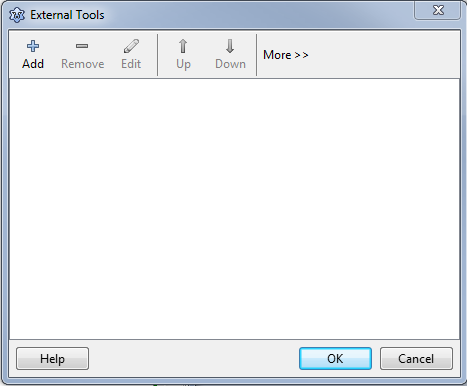 Opens the External Tool dialog to add a new tool. Delete the currently selected item. It will ask, if you want to do that. Opens the External Tool dialog to edit the currently selected tool. Move the current item one position up. Move the current item one position down. Save changes and close dialog. Discard changes and close the dialog. This page was last modified on 22 September 2016, at 12:34. This page has been accessed 4,348 times.